Despite a later start, Hornblower officials are “pumped up” to kick off their fifth season May 5. During the past two years, the attraction’s season began April 1. But a long winter and a rough start to spring has pushed this season’s start back by a month. “This year we were hopeful to open actually March 28 because we wanted to capture the Easter weekend, but Mother Nature didn’t see things the same way as us,” said general manager Mory DiMaurizio. DiMaurizio said Hornblower typically concludes its season Nov. 30, but a couple years ago extended the season until Dec. 4 at the request of the Niagara Parks Commission to participate in the Winter Festival of Lights. The boat-tour operator is coming off back-to-back seasons of record-breaking ridership numbers. Its 2017 season saw 2.3-million visitors. DiMaurizio said whether Hornblower experiences another record-breaking season will depend on the weather. A highlight this season for Hornblower will be its new and modernized incline. 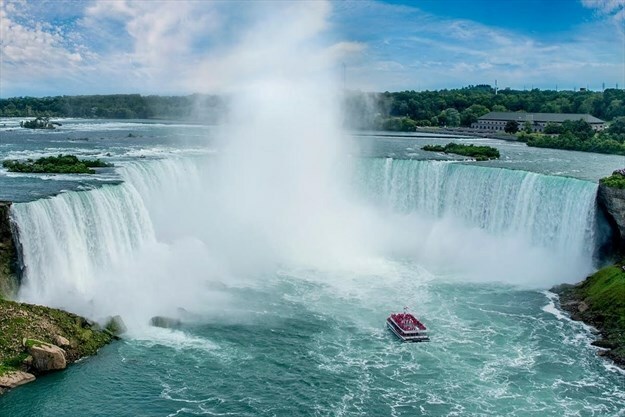 The $5-million investment will operate along the Niagara Gorge offering unobstructed and panoramic views of the falls. The two, 56-passenger, fully glass enclosed cars will ascend and descend along the 185-foot and 18,000-year-old rock walls. The cars are designed to optimize the guests’ viewing experience as well as offer many comforts and conveniences including exclusive group check-in; express admission to the Hornblower landing; climate-controlled cars; wheelchair accessible seating and an informative in-car audio. Hornblower’s group check-in also recently underwent major redevelopment at the foot of Clifton Hill with a brand new 250-square-foot building to sell group tickets. “We have many new experiences and products we’re excited to be launching this season,” said DiMaurizio. Meanwhile, on the U.S. side, the Maid of the Mist launched its 133rd season Friday. The season is expected to run through Nov. 4.